This semester, I have been placed at John Burroughs School as my clinical site. Dean Tiffany ATC is my preceptor and Matt Eifert is the PY2 at JBS. It has been a transition for me from the college setting to the high school setting, but I am enjoying the high school setting much more than I thought I would. We are very fortunate to have an incredible athletic training room and access to a handful of modalities, as well as respectful and friendly students and staff. At John Burroughs, Dean is very willing to let me and Matt take the lead on doing assessments and only steps in when he sees we need help. This is allowing me to get out of my comfort zone and realize that I know more than I think I do. I get loads of hands-on experience at JBS and it has helped my confidence improve ten-fold. Dean is extremely knowledgeable and has many tips and tricks up his sleeve that he has shown me and Matt. I think he is an incredible preceptor and I am learning so much from him! Matt has also been a great resource for me because I can turn to him for any questions I have. He practices with me when I don’t understand something and he is always enthusiastic when he is in the Athletic Training room. He makes me excited to walk into the Athletic Training room every day! So far, John Burroughs couldn’t be any better. I really feel like my knowledge of Athletic Training has sky rocketed since I arrived at JBS, and I am excited to continually learn more. Dean is a phenomenal preceptor and I have enjoyed every minute learning from him. This semester we have gotten the opportunity to experience NAIA collegiate level athletics at Lindenwood University – Belleville. We are helping provide care for all sports including but not limited to: Men’s and Women’s Hockey, Baseball, Softball, Men’s and Women’s Soccer, Track and Field and Wrestling. We have gotten the chance to learn together in an engaging environment with each other as well as with the LUB athletic training students and amazing AT staff. 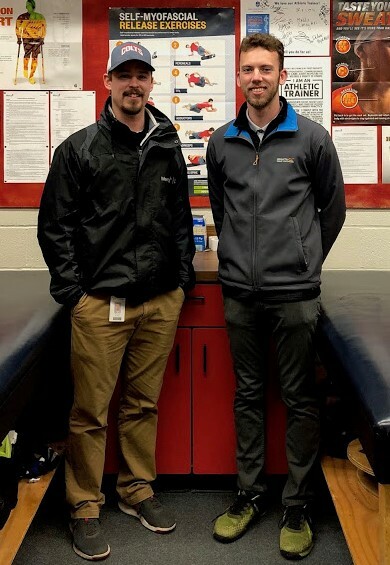 Our preceptors, Stephen Slone MS, ATC, LAT, Curtis Wilkerson MS, ATC, LAT, Timothy Woodstock MS, ATC, LAT have been incredibly helpful by showing us new treatment techniques as well as other ways to help the athletes. The entire Lynx AT staff is extremely knowledgeable and willing to answer any questions we may have. It is obvious that they want us to reach our full potential, so they are constantly there to encourage us and make sure that we are confident in our abilities. 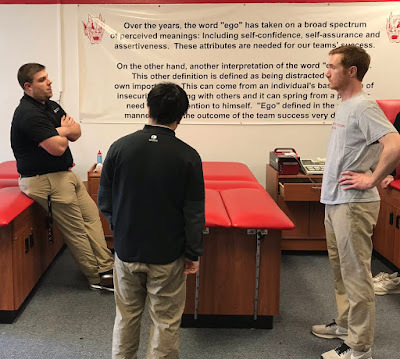 Some of our responsibilities include developing and implementing rehabilitation programs for individualized athletes, writing SOAP notes, preventative care such as taping and stretching, use of modalities, and performing evaluations. Lindenwood University – Belleville offers an immersive environment that has been very rewarding since we are able to really get to know some many different athletes along with being able to witness multiple athletes progress in their rehabilitation post-injury. 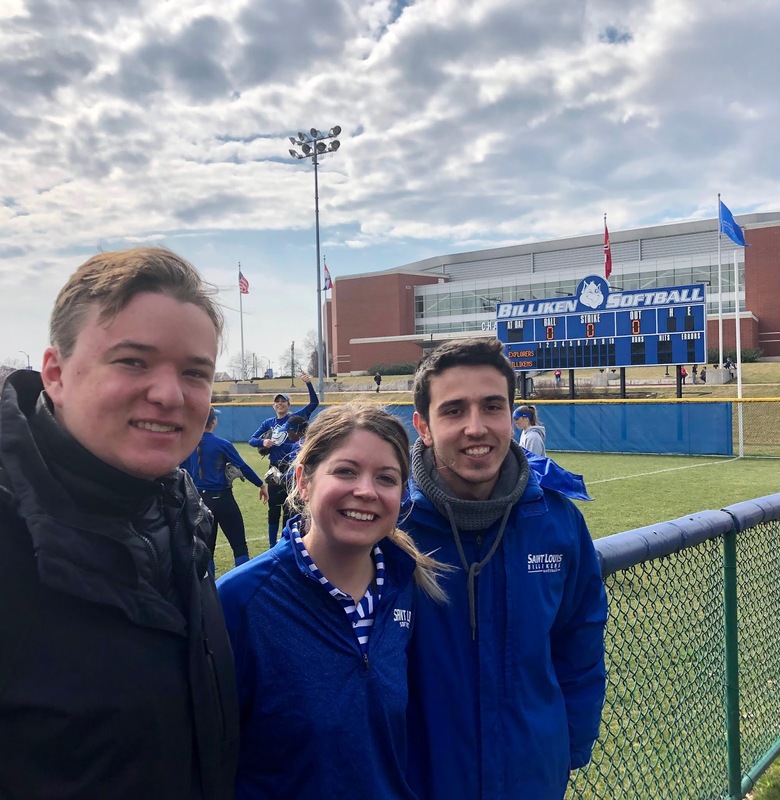 Adam and Justin, the PY2's, have gotten to primarily assist with pre-, in-game, and post-game responsibilities for both men’s and women’s hockey; along with practice coverage. Their main role as of now is to help prepare the team and gear up for their national tournaments in Nashville and Texas for men/women respectively. 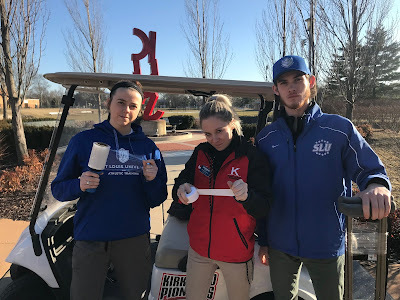 PY1's Hannah and Becca have been helping out with mainly baseball as well as other duties in the athletic training room. We are really getting to see how different the collegiate level is from the high school setting considering we were both placed at different high schools last semester. Every day we continue to improve our skills as well as learn how to connect with our athletes and peers to provide the best patient centered care. Overall, we are all looking forward to what the rest of the semester has in store for us! Chaminade College Prep has been a great experience and has given me the opportunity to further my skills. Scott Kugler ATC is my preceptor at Chaminade and has helped me whenever I need it and explains his thought process on certain situations as well as his process on evaluations. I have had multiple opportunities to practice evaluations and well as help athletes in their rehab programs. 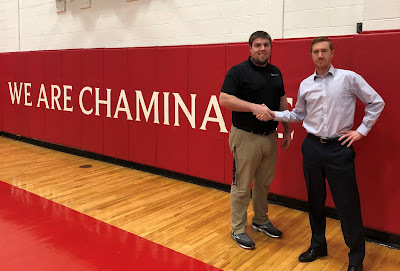 Starting my clinical rotation at Chaminade I did not have much experience going through evaluations start to finish so my experience so far has really helped. Most evaluations I have performed were on the lower extremities and only a couple for upper extremities. One of the biggest things I have learned from going through the evaluations is to really think about the questions you want to ask in the history so you can get a whole picture of what happened and what may be wrong. My experience so far is that some athletes will come in and immediately tell you anything and everything about what happened while others are really quiet and you have to ask multiple questions to get a glimpse at what is going on. Another thing I have really tried to work on with my evaluations is being systematic and knowing what I want to do so that I do not forget anything. 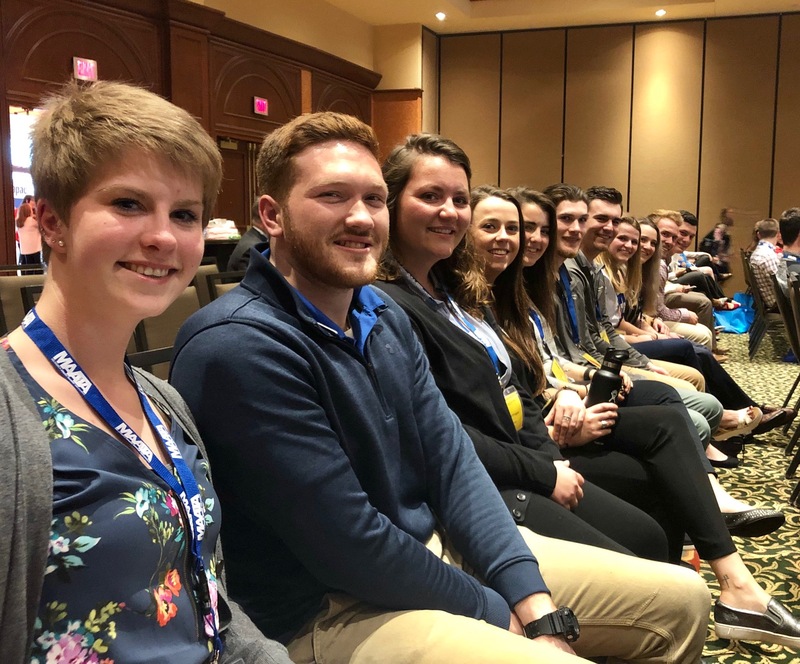 Saint Louis University Athletic Training Program faculty and eleven students traveled to Tulsa, Oklahoma from March 28-30, 2019 for the Mid-America Athletic Trainers' Association's Annual Meeting. 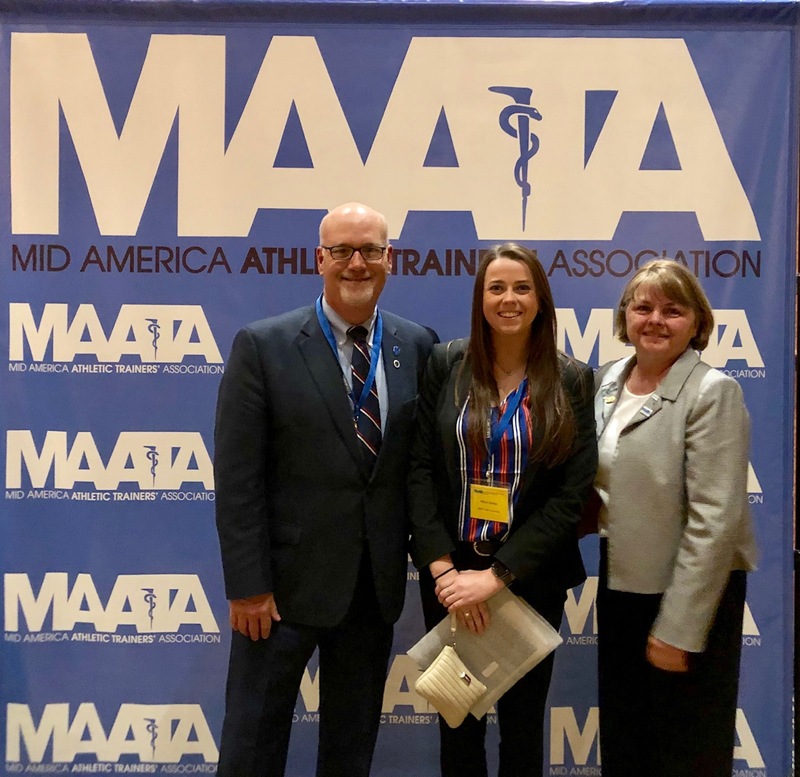 Dr. Kitty Newsham, faculty member and MAATA Secretary presented "Single-Subject Research Design Informing Clinical Decision Making". SLU AT Students Cody Hutson, Matt Murphy and Jesse Schmitt participated in the MAATA Quiz Bowl. 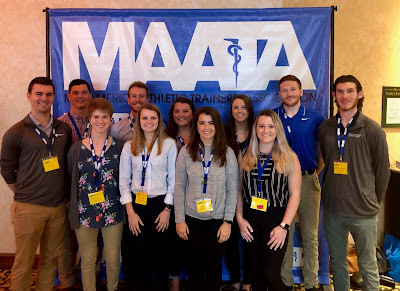 SLU AT Students attending the MAATA Business Meeting. 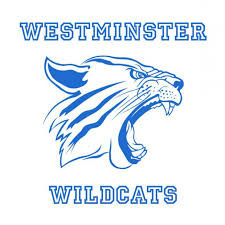 Westminster Christian Academy has been an incredible clinical experience over the past 8 months. 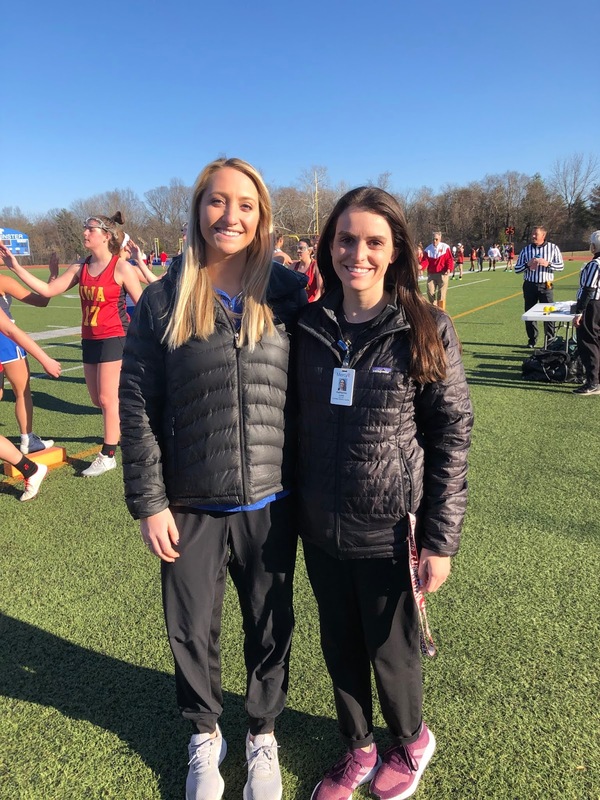 My preceptor, Mercy Sports Medicine Athletic Trainer and SLU alum, Katherine Love MAT, ATC, has been an inspiring mentor and athletic trainer to look up to. I cherish the relationships I have made with school coaches, administrators and many student athletes over the past months. 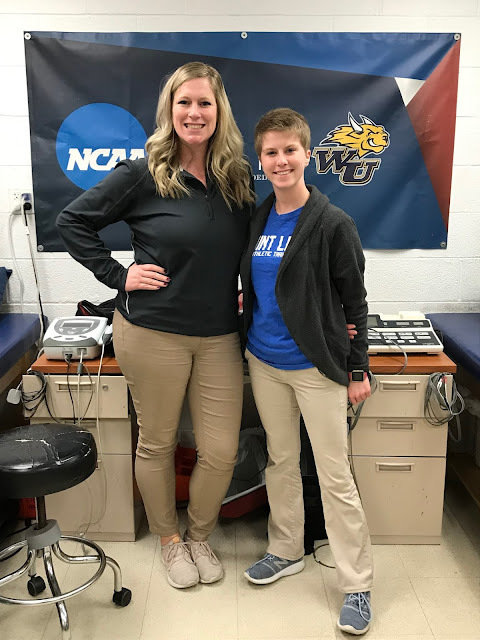 As an athletic training student at Westminster Christian Academy, my clinical knowledge, assessment and management skills, and my problem-solving skills have flourished. With Spring sports starting up, the athletic training room is very crowded once again. And as we transition from indoor sports to outdoor sports, we treat many athletes with lower extremity pathologies including, medial tibial stress syndrome, patellofemoral pain, quad or hamstring strains, and ankle sprains. The WCA teams are all off to a great start. Our girl’s and boy’s lacrosse teams each had their first game, and win, of the season. I am excited to watch them play this Spring and see the multitude of talent both teams have! Working with high school athletes is such a blessing because of their love for the sports they play. 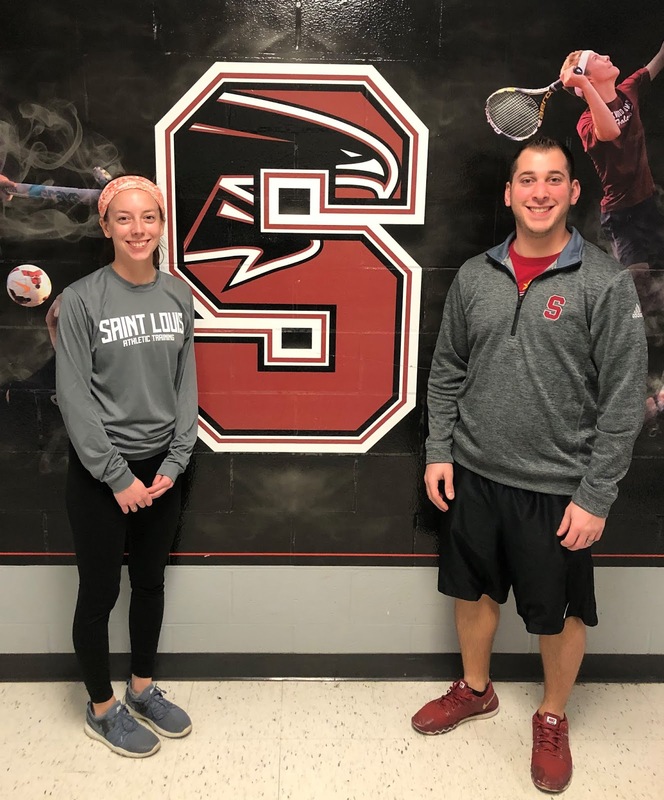 I have worked with a variety of injuries this year and each athlete works hard to complete the rehab protocols Katherine and I make for them, so they can get back on the field or court as soon as possible. I am fortunate to be a part of the WCA family. Go Wildcats! I have had the privilege of spending much of this spring semester at Nutriformance, an award-winning fitness center in St. Louis. Most of my time has been spent at a site associated with Nutriformance called All-Star Performance, a large training facility that specializes in training baseball and softball athletes. Professionals at this facility not only work on general strength and conditioning for the athletes, but also the improvement of sports specific skills such as hitting and pitching. 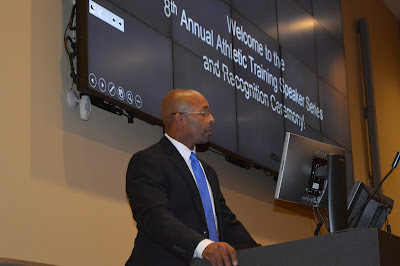 The general goal of this site is to improve the performance of its athletes and to keep them healthy in the process (due to the nature of the sport). 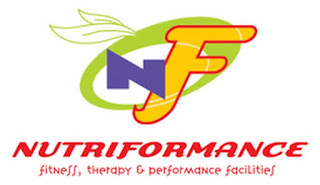 My time at Nutriformance has afforded me the opportunity to play a more active role in the realm of sports performance, something that I currently aspire to do sometime in the near future. I have spent the most significant portion of my time with Eric Finley, MS, RD, LD. He has taught me many of the important aspects of strength and conditioning, especially within a group setting. 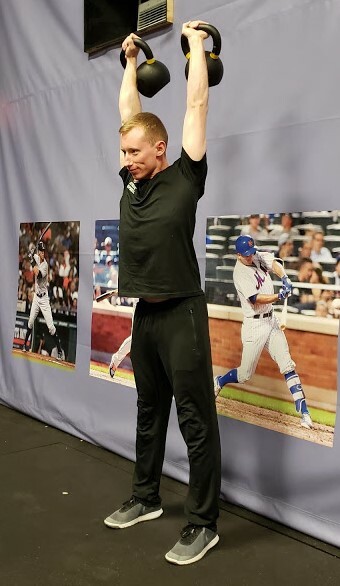 I have played a small role in many of the group workouts at All-Star Performance, lending a guiding hand to any athletes who had questions or required additional assistance. The professionals at Nutriformance place especial importance on proper movement mechanics in everything that the athletes do. This not only enhances their performance within their sport, but it also helps to prevent injury. I was given the opportunity to observe a program at All-Star Performance called Mach 1. This program focuses on the longevity of young pitchers by adopting this very same principle. I am grateful to be able to have learned from my experience at Nutriformance and I know that this will serve me well on whatever path I choose. Spending almost a full academic year at Parkway South High School has helped me gain the best clinical experiences I could have during my final year of graduate school. Being able to learn from Mike Tzianos ATC, has been an incredible opportunity. I have expanded my skillset and gained confidence to allow me to practice on my own once I become certified in a few short weeks. As I entered my final semester as an athletic training student at Parkway South, I was given more independence. I would take athletes through their rehab and come up with a plan about their return to play. Once I talked it through with my preceptor, I would be the one to have that conversation with the coaches. Since I will be doing this soon without direct supervision, it was great to have the responsibility so that I could feel confident having these conversations. 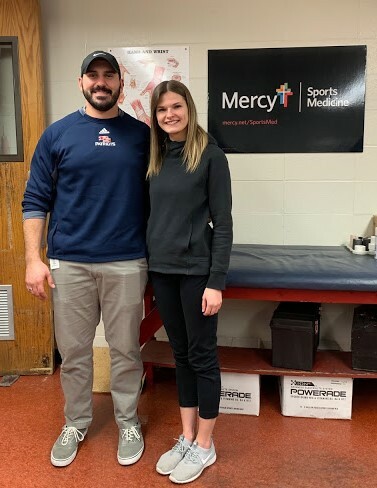 I also had the chance to shadow Dr. Brian Mahaffey, primary care sports medicine physician for Mercy Sports Medicine and the St. Louis Cardinals. This gave me the chance to shadow his athletic trainer to see how athletic trainers practice in the clinical setting. I was able to look at different radiographs of all types of orthopedic conditions, observe different types of injections, and learn how different types of conditions are managed by a sports medicine physician. I look forward to finishing up the year with the spring sports. I am eager to continue to take on greater responsibility before I finish up my time with the Parkway South Patriots. So far my clinical experience at Harris-Stowe State University has been great and has given me a new lens on the college setting of athletic training. I think one of the main differences between this semester and last is that I know so much more than I did starting out on clinical rotations in the fall. It’s been great to be able to apply my skillsets every day and learn from my preceptor. 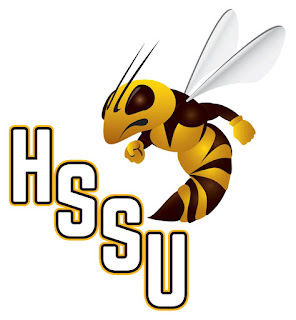 Since my preceptor, Tim Herlihy ATC, is the only athletic trainer at HSSU, I get a lot of hands-on action with the athletes. This has been extremely beneficial to my growth as a student and future athletic trainer. I’ve been able to work new rehab protocols, learn new taping techniques, and see first-hand what chiropractors do. 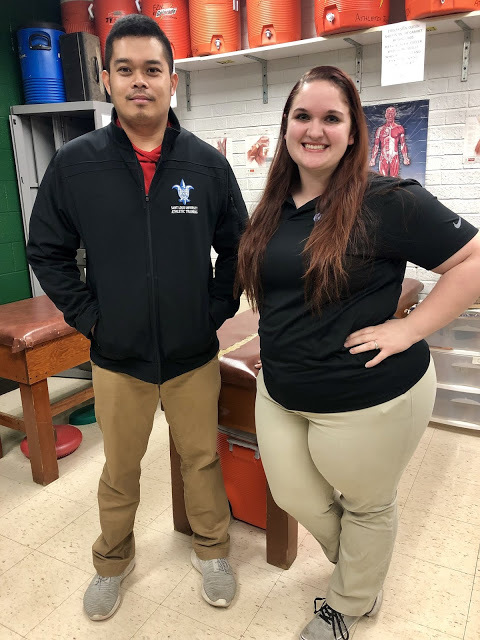 Harris-Stowe has three chiropractors that do rotations on different days each week so that has been fun getting to see their skillsets play out. I learn from them just as much as I learn from Tim. 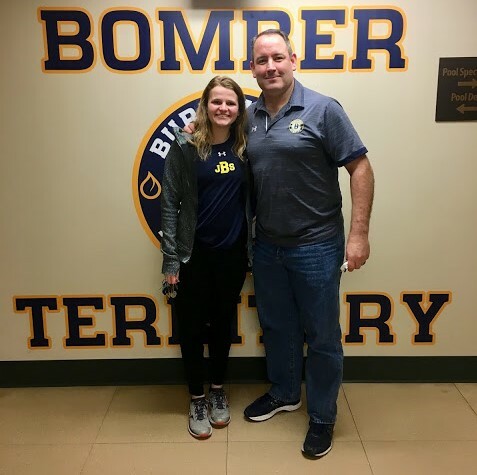 My overall learning experience has been challenging, yet rewarding, especially because I am able to apply and see the difference it makes in the athletes I help. Thus far, our clinical experience with Sports Medicine at Saint Louis University has been an exciting and immersive experience for those of us placed there. 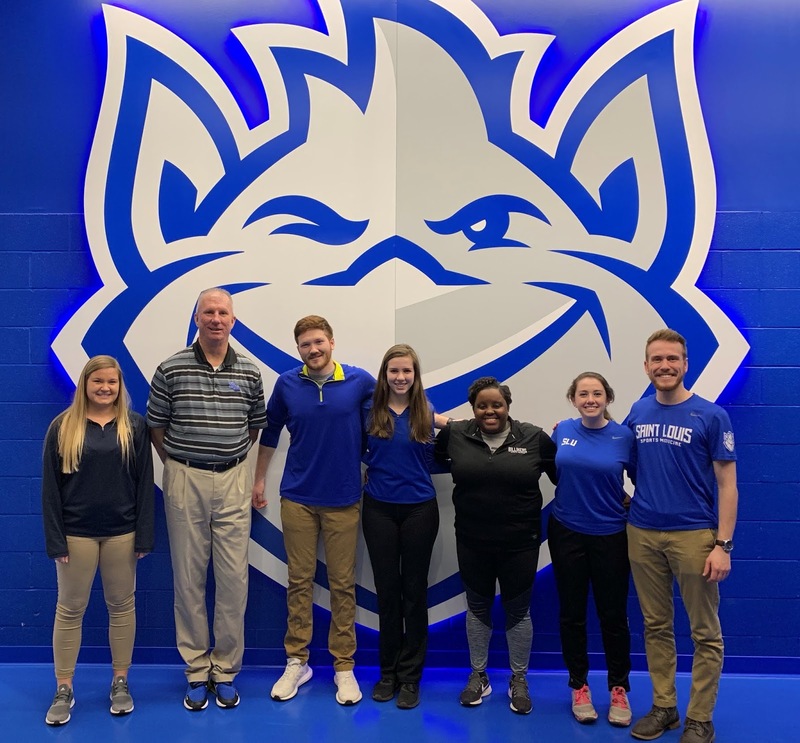 Being at an NCAA Division I institution with the Billiken Athletics comes with the special experience of being exposed to a population of athletes completing at a high intensity and demanding level every day. 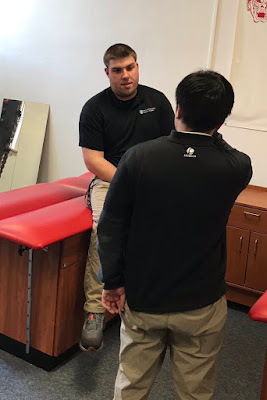 Having both first and second year students at the site allows for education through our preceptors and each other, thus furthering our clinical skills while applying new knowledge from the classroom. 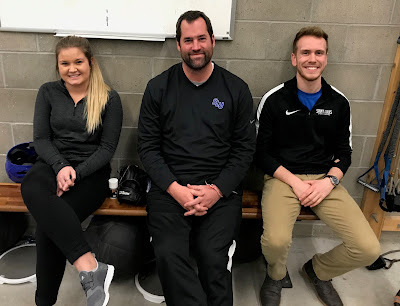 We each work with a specific few teams under our preceptor, but also get the opportunity to experience other sports and athletes while in the AT room. Our experiences can range from simple wound care to advance rehabilitation program to help an athlete return to sport. 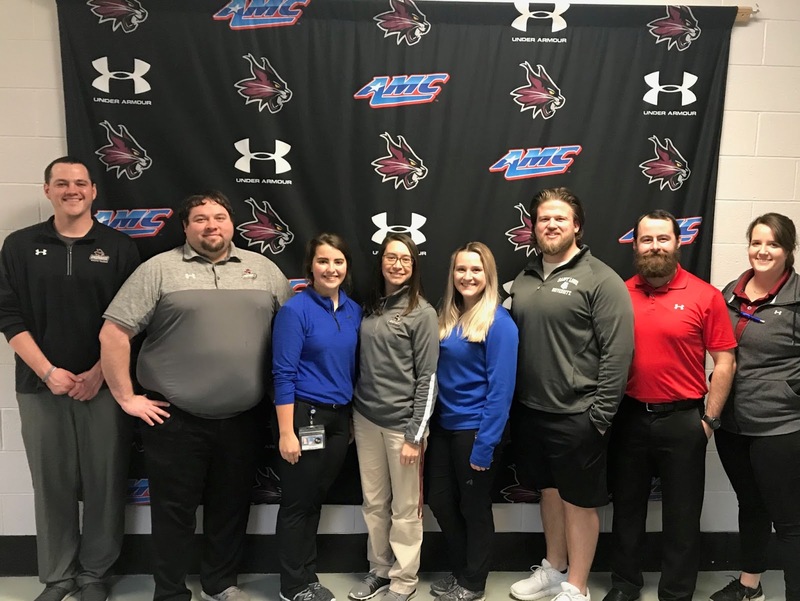 SLU Athletic Trainers Jonathan Burch ATC, Ben Heimos ATC, Petra Knight ATC, Elena Melillo ATC and Angie Wills ATC are more than supportive and knowledge preceptors that provide us with valuable resources and knowledge as we continue our education to be Certified Athletic Trainers. Additionally, SLU as a clinical site allows for the opportunity with work a large array of resources. As students, we get the opportunity to utilize many modalities and exercise equipment including LASER, ultrasound, electrotherapy, game ready, Normatek, cold tubs and SwimEx, as well as, a fully equipped weight room across the hallway. This equipment allows us to learn, gain confident and diversify our treatment program for athletes. We also have access to strength and conditioning coaches, sports nutritionist, and physical therapy to collaborate with in order to provide the best quality care possible. Overall, SLU is a clinical site that offers students many different hands on experience in order to advance their skills and knowledge for the day they become certified athletic trainers. 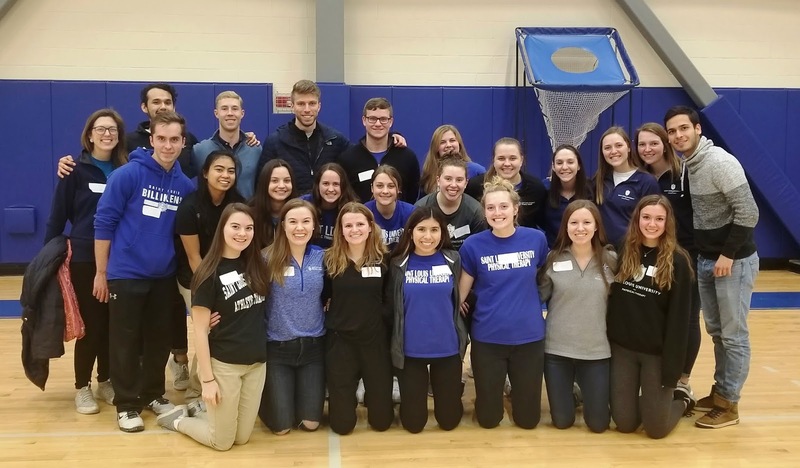 The Saint Louis University Athletic Training Society (SLATS) and SLU Physical Therapy Student Association (PTSA) teamed up to receive a SLU 1818 service grant to be able to pair with a community partner. 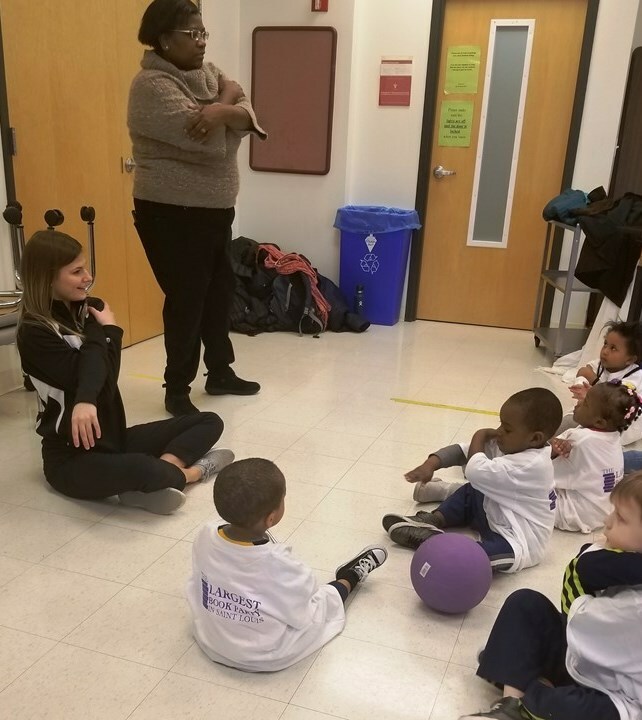 We paired up with Unleashing Potential (UP), an early childhood and after school program, just down the street from SLU’s campus. 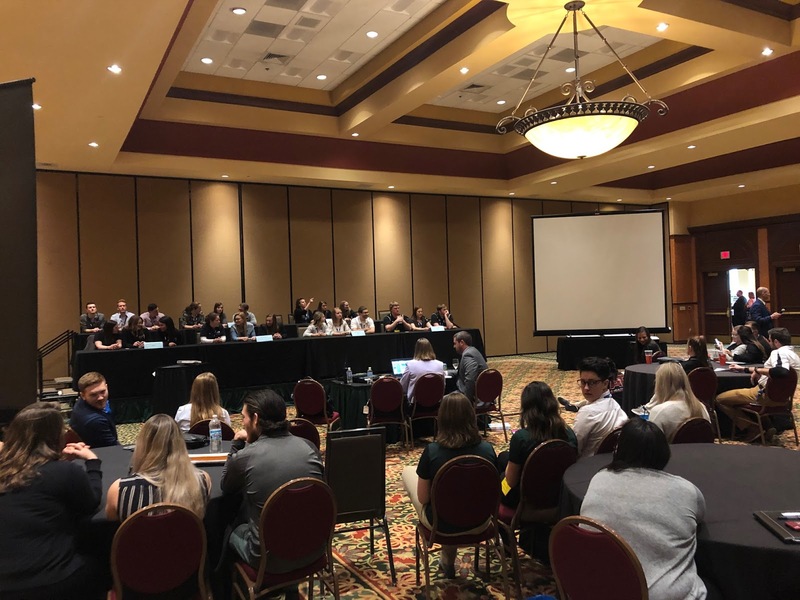 The goal of this project was to increase awareness and spark interests for what classes need to be taken before college to set students up for success. The day was split into two sessions depending on the ages of the children. In the morning group, 3-to-5-year old’s from UP joined us on the medical campus of Saint Louis University. 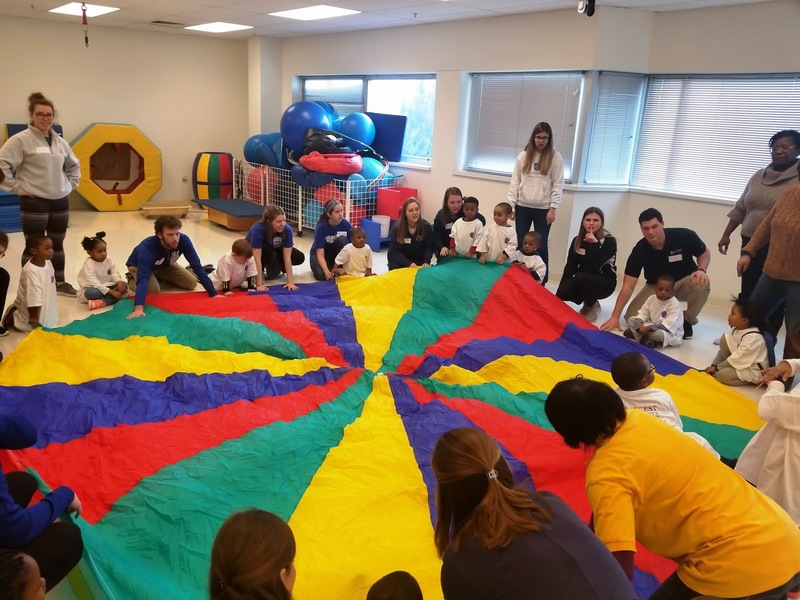 We included stretching, exercise, wellness, and educational activities that incorporate what athletic trainers and physical therapist’s do. Some examples were setting up an obstacle course that contained ladder runs, mini hurdles, and cones for the exercise portion of the day. We played “pin the Band-Aid on the person” to show that wound care is part of the AT profession. We made coloring books of basic anatomy worksheets, so the children understood that anatomy is a major class that is needed when studying athletic training and physical therapy. 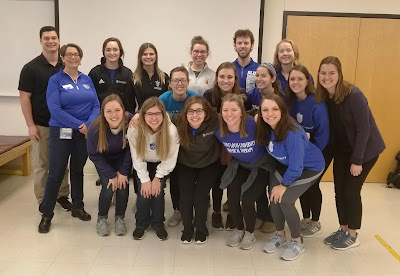 We also talked about nutrition and ended the day with a healthy snack, prepared by SLU’s own nutrition and dietetics students at the café in the building. The afternoon session consisted of 5-to-12-year old’s from UP. They joined us at Chaifetz arena on SLU’s north campus for a day packed with activities similar to the morning session. The 4 activities still included stretching, exercise, wellness, and educational aspects. They were able to trace themselves on large pieces of paper and label specific anatomical characteristics on their own traced out body. The children learned how to tape wrists with some of the athletic training students. They worked on balance on Airex pads and ran through obstacle courses. 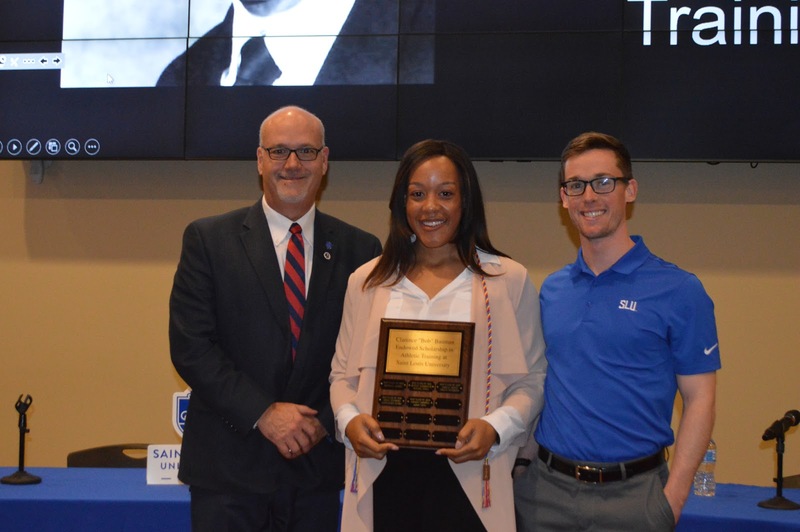 This project was a major success that was made possible by the 1818 grant provided by SLU. The Department of Athletic Training and Physical Therapy worked together cohesively for weeks to put on such an exciting day for the children of Unleashing Potential. 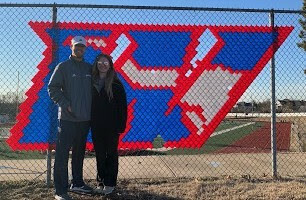 The hope is to be able to do this project again and spark interest in the fields of athletic training and physical therapy. 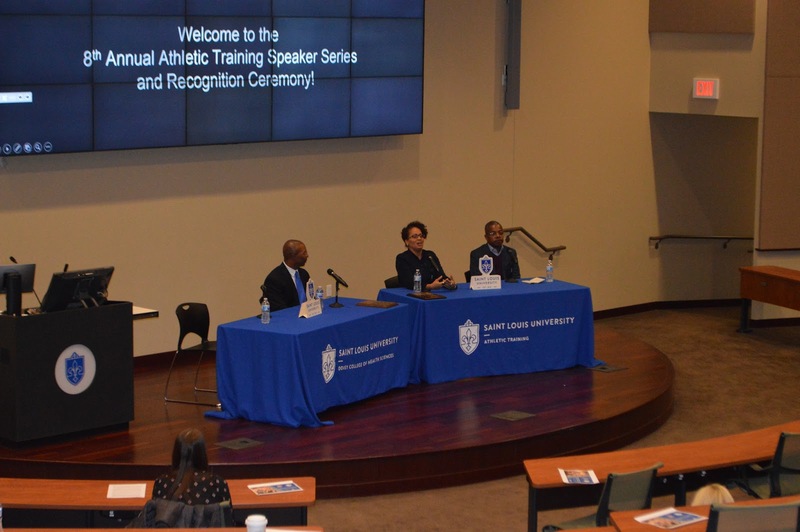 The Saint Louis University Athletic Training Program hosted its 8th Annual Speaker Series and Recognition Ceremony on Monday, February 18, 2019 at 7:00 pm in the Education Union Auditorium on Medical Center (South) Campus. 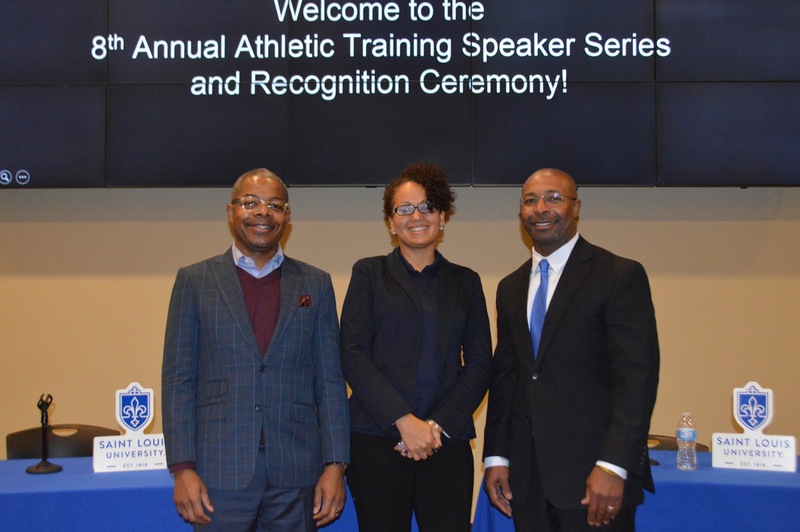 The event was presented by the Saint Louis University chapter of Iota Tau Alpha - the Athletic Training Honor Society - and supported by the SLU Student Government Association. The evening began with the 2019 initiation ceremony for the SLU Alpha Iota Chapter of Iota Tau Alpha, the National Athletic Training Honor Society. 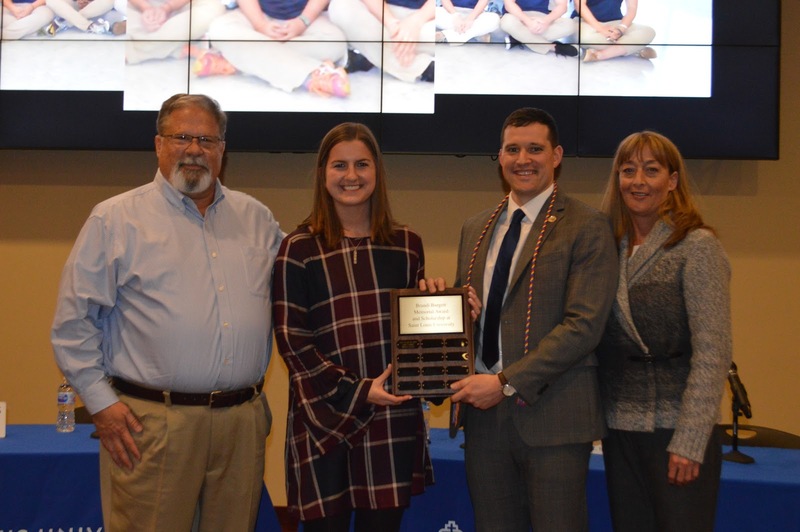 The Brandi Burgett Memorial Award and Scholarship was dedicated, with Brandi's parents Robert and Marnie Burgett making remarks and recognizing the inaugural scholarship honorees Erin Fabbri and Brian Leach. Bauman Scholarship award winners Jazmon Carroll and Adam Long were also recognized. Fr. Robert Murphy SJ gave an invocation and Dr. Tricia Austin, Chair of the SLU Department of Physical Therapy and Athletic Training, made introductory remarks and welcomed attendees. 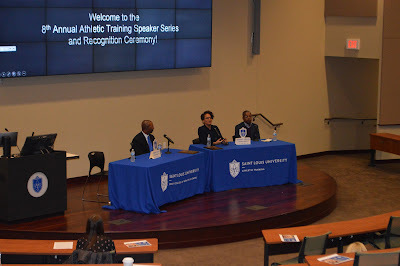 Following the keynote presentation, there was a panel discussion which included Murphy Grant; along with Rhonda BeLue, PhD, Chair of the Department of Health Management and Policy in the SLU College for Public Health and Social Justice and Ron Wagner, Ph.D, ATC, Founder and President of the Athleticare Sports Health Foundation. 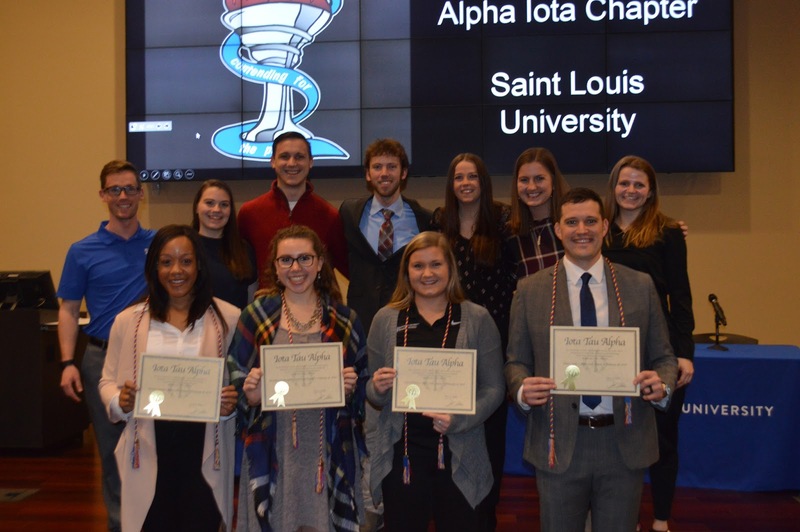 It was once again an evening of informative discussion and special recognition of SLU AT students!